In the years between Revenge of the Sith and the announcement that Disney had purchased Lucasfilm and would be making new films, Star Wars fans heard a lot about a live action Star Wars series set between Episodes III and IV that George Lucas was working on. It would later be revealed that the series had the working title "Underworld" and a few details about the series were revealed by writers Stephen Scaia and Ronald D. Moore. The series was put on hold a few years prior to the Disney sale and most assumed it would stay there once Disney took control. 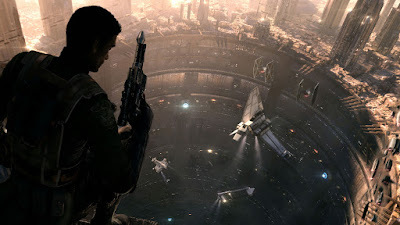 Not necessarily according Lucasfilm President Kathleen Kennedy who revealed to /Film that they were still exploring options for "Underworld" as well as the video game Star Wars: 1313 which was cancelled when LucasArts was shut down in 2013 and would have tied into the series. "No. No, interestingly enough, that's an area we’ve spent a lot of time, reading through the material that he developed is something we very much would like to explore. And there was 1313 the game, where there was…unbelievable. So our attitude is, we don’t want to throw any of that stuff away. It’s gold. And it’s something we’re spending a lot of time looking at, pouring through, discussing, and we may very well develop those things further. We definitely want to." It's very exciting to hear that these projects are not as dead as they once seemed. According to George Lucas there were two seasons worth of scripts finished for "Underworld" and we know that 1313 was fairly far along in its development (though the story kept changing). Concept art from the game can be seen in the fantastic Star Wars Art: Concepts book that was released a few years ago. "Underworld" has left some mark on the Star Wars canon, at Celebration Europe 2013 Lucasfilm's Pablo Hidalgo revealed that concepts and hints about the series were included in Star Wars: The Clone Wars as far back as season two. Also it's interesting to not that Kennedy was not prompted to bring up 1313, only "Underworld", according to Peter at /Film, who interviewed Kennedy. This seems to suggest, to me, that there was more cross over between the two projects than we initially thought. Hopefully both projects eventually see a release. They seemed like cool concepts for Star Wars and hopefully they find a place in the new Star Wars canon. well rebels effectively has set some canon elements for the time period between the fall of the galactic empire and the events of A New Hope... so Underworld could have been seen as superfluous... and because it isn't, it must mean there's something really cool on the horizon. 1313 is a MUST happen since SOE killed and pulled the plug on Star Wars Galaxies there has not been a Star wars game out there that game close to the real Star wars world. So we need a new Star wars game just like SWG was and soon. Indeed! They are alright but aren't a substitute for SWG. I have been checking out SW games on my phone of all things. I wouldn't have dreamed of such a thing when SWG was around. Obviously, I am still missing something I enjoyed for so many years with SWG. Yes with SWG gone for good something along the lines of 1313 would be great. Really miss playing on Naritus! Force Unleashed 3! Make it now!! !